Forward Justin Martin led the Musketeers with 15 points in Tuesday's 70-60 win over St. John's. It was Xavier's first game as members of the Big East Conference. CINCINNATI — You’ll forgive Xavier fans if they were a bit anxious Tuesday afternoon. They had been waiting since May for this moment and now their Musketeers were making them wait a little longer. Xavier didn’t score for the first eight minutes in its Big East opener against visiting St. John’s. There were some open looks but for one reason or another the ball just wouldn’t go through the rim, so the faithful at Cintas Center remained standing and clapping, waiting. Their patience was rewarded because the Musketeers were patient and confident. 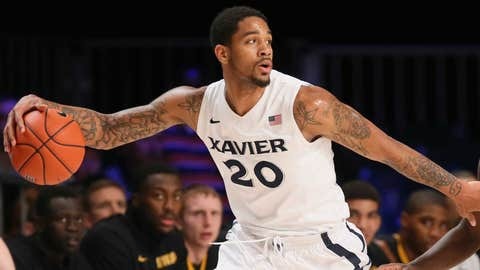 Xavier put aside that poor offensive start and ran off with a 70-60 win in its first game in its new conference. Justin Martin led the Musketeers with 15 points but this was an all-around team effort. Contributions came across the lineup as Xavier won its sixth straight game and improved to 11-3 overall. 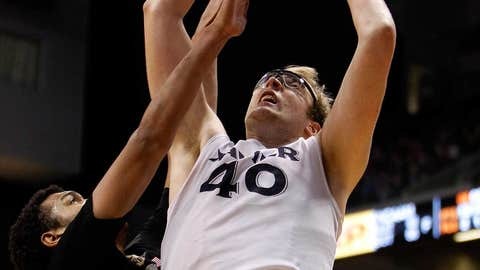 Center Matt Stainbrook had 10 rebounds to go with his nine points. Forward Isaiah Philmore had nine rebounds and 11 points. Guard Semaj Christon scored 10 points but also had eight assists and didn’t commit a turnover. Xavier missed its first 11 field goal attempts but then proceeded to make 25 of 45 shots the rest of the way while holding St. John’s to its lowest point total of the season on its lowest shooting percentage. "Those are our roles," said Philmore. "Everybody has got their roles and everybody is doing them, which is why we’re winning. We’re doing them without excuses and we’re doing them to the fullest extent. That’s what teams do and we’re playing as a team now. That’s the reason we’ve gone on our winning streak." The Musketeers went 0-3 at the Battle for Atlantis tournament in the Bahamas and struggled in wins against Bowling Green and Evansville once returning but have beaten Cincinnati, Alabama, Wake Forest and now St. John’s with impressive efforts. Xavier took a total of 56 shots but no one had more than nine attempts. It went 13 of 23 (56.5 percent) from the field in the second half, the highest percentage St. John’s has allowed in any half this season. The Musketeers had 17 assists on their 25 made field goals. Of the nine Musketeers who played, only freshman Jalen Reynolds was on the court for less than 12 minutes but even in his five minutes of action Reynolds scored four points and grabbed two rebounds. St. John’s came into the game averaging 75.3 points per game and shooting 46.2 percent from the field but Xavier held the Red Storm to 30.9 percent shooting. While Xavier was going scoreless the first eight minutes, St. John’s was only able to forge a 9-0 lead. "We had good shots but they just weren’t falling," said Christon. "We were attacking the basket and had shots but they just weren’t going in. We still played good defense. We didn’t let that affect us on the defensive side." Stainbrook scored the Musketeers’ first points on a short stickback of his own blocked shot. Xavier eventually got even three times in the half but never took the lead and trailed 29-27 at halftime. The Musketeers needed just 35 seconds to score in the second half and reeled off the first 13 points to take a 40-29 lead. Martin scored nine points during the run and had 11 points in the first 6:18 of the half. St. John’s never got closer than four points after Xavier’s run. Red Storm coach Steve Lavin said his team did what it wanted to do in the first half by limiting Xavier’s transition baskets, rebounding and keeping the ball out of Stainbrook’s hands when Xavier was running its half-court offense. "Some players stepped up, which is what has to happen when a team is putting heavy heat on your primary scorers," said Lavin. "It’s going to open up your third, fourth and fifth options on the floor. If those players step up and make plays then you’re into a cat-and-mouse, chess match element where you pick your poison. That’s a credit to Xavier collectively as a group." Christon is Xavier’s leading scorer, averaging 14.7 points per game. Tuesday was his fourth straight game in which he’s scored 12 points or less but that is anything but a concern for coach Chris Mack. Christon is going to be the focus of any opposing defense. St. John’s focused on him but Christon never flinched in the moment. He got the ball in various spots on the floor and made things happen for his teammates. Mack said the UC game in which Christon played just 20 minutes because of foul troubles and scored just eight points yet Xavier still won in dominating fashion was a lesson for Christon. "One of the reasons we move him all around is because he has the dimension, he’s such a gifted passer and he can also slash and attack the rim and our guys have a lot of confidence in finding him," said Mack. "I think when Semaj got saddled with foul trouble against UC, I think it really opened his eyes to an unbelievable confidence that he feels in his teammates. I don’t think he forces much anymore. We want him to attack in transition — it wasn’t easy to get out in transition today early on — but I really think he has a confidence in Philmore, James Farr and certainly Matt Stainbrook. "The guys have been playing extremely well together. It’s what we’ve been preaching from the beginning of time. We’re a team. We’re going to go through some ups and downs and we have to learn from both. Semaj is part of that learning curve."